There has been a church at Bow in East London for over 700 years; even after various restoration works parts of its current buildings date back to the 1490s. Over the years, the church has played a part in some major historical events, from Catholic executions ordered by Mary I through to bomb damage in the Second World War. It is also given a nod in the children’s nursery rhyme “Oranges and Lemons” – this is the home of the great bell of Bow. The church is still in use today as a place of worship and, as a Grade II listed building, is well worth a visit. Bow church started its life as a chapel of ease. It was commissioned in 1311 by Bishop Ralph Baldock to give residents a local place of worship. 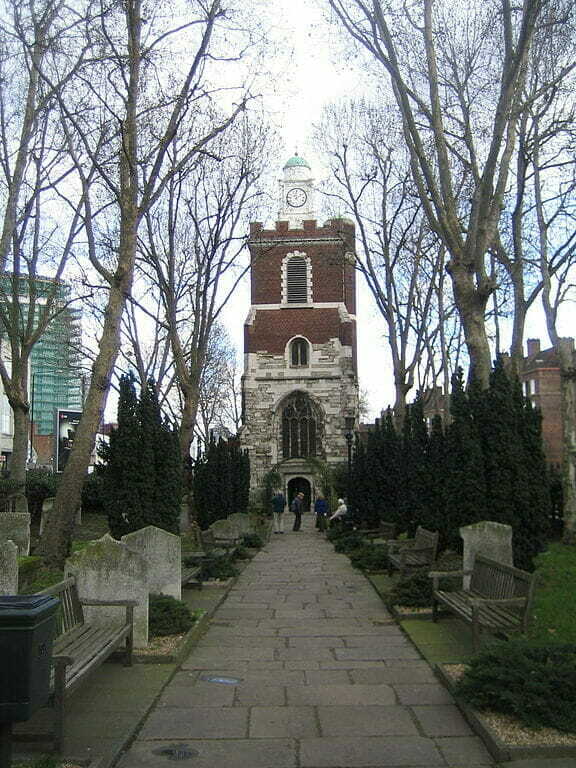 Before this date, they had to travel to St Dunstan’s in Stepney if they wanted to attend a service. The chapel did not become an independent church with its own parish until the early 1700s, when it was consecrated as the church of St Mary, Stratford, Bow. During the reign of Mary I, many Protestants were punished for their religious beliefs, some of whom were executed in and around Bow. This may have been the site of execution for the Stratford Martyrs, although some historians believe that their execution site was down the road at the Church of St John the Evangelist in Stratford itself. There was a public execution site in Bow, close to the church, and this was definitely the place where a Catholic lady, Elizabeth Warren, died in 1555. She lived in a house in the churchyard and was burned at the stake close to the east side of the church for her religious beliefs. The East End of London did not see much fighting action in the English Civil War in the 1600s. But, Bow Church may have done. In June 1648, it is said that a group of Parliamentary Roundheads were forced to seek refuge in the church from a group of Royalist soldiers. In 1829, the church tower was badly damaged in a storm, causing it to collapse. Although it was rebuilt at the time, it was to suffer further damage in the Second World War. In 1896 the chancel roof also collapsed and needed significant restoration work. The church was hit, unluckily, by one of the last bombs to be dropped in the last big Blitz raid in 1941, causing significant damage to the tower and the west side of the church. The damage was so bad that the church had to close for around seven months. Full restoration work at this point started in 1949 and took until the early 1950s. In 1951, the Queen visited the church to see the restoration project in action. If you visit Bow Church, you will see a statue outside of a former Prime Minister, William Gladstone. The statue was erected with help from Theodore Bryant, one of the owners of the local Bryant and May match factory. This factory was the location for one of the most famous strikes in the East End in 1888, known as the Match Girls Strike. Although nobody knows whether this is true or not, the local workers at the factory believed that the money raised to pay for the statue had come out of their wages. The girls believed that the factory owner had taken a shilling out of each of their wage packets to help pay for the memorial to Gladstone. Many of the workers attended the statue’s unveiling ceremony. It is said that some of them cut their arms and let their blood drip on to the statue. Over the years, Gladstone’s outstretched hand has been vandalised with red paint quite a few times as a mark of respect to the workers of the factory and their bad working conditions. This is supposed to highlight the fact that the statue was paid for with the blood of the Bryant and May workers. One of the most famous people connected with Bow Church was George Lansbury. He moved into the Bow area and started to attend the church here. Lansbury was a local MP representing Bromley and Bow, a well-known social reformer and ultimately the leader of the UK’s Labour Party. A pacifist, Lansbury lobbied against the Second World War and famously even met with Hitler to try to prevent the war from starting. Lansbury was nominated for the Nobel Peace Prize. He was a member of the congregation at Bow for over forty years and served on the church council. His funeral service was held in the church in 1940. Many people from the East End claim to be true East Enders, but the truth is to be a true East Ender you have to be born when the great bells of of Bow located in the city are ringing as you are being born. If they are not ringing when you are born you can not claim to be a true East Ender! The “great bells of Bow” are NOT at Bow church in Tower Hamlets. They are the bells of St. Mary-le-Bow in the City.